Built: 15th or early 16th century. Notes: Ballinalacken Castle is a two-stage tower house of uncertain date but most likely built in the 15th or early 16th century. It is located on a limestone outcrop overlooking the road from Lisdoonvarna to Fanore in County Clare, Ireland in the grounds of Ballinalacken Castle Hotel which was built in 1840 as the home of Lord O'Brien. The name is taken from the townland where it is located, the original Irish version of which is Baile na Leacan, which means the town (land) of the flagstones. The basements of Ballinalacken Castle are thought to have been set as far as the 10th century, by another noted Irish clan, the O'Connor's, who ruled West Corcomroe in those times. The fortress was founded in the 14th century and Lochlan MacCon O'Connor was in charge of its first rebuilding. 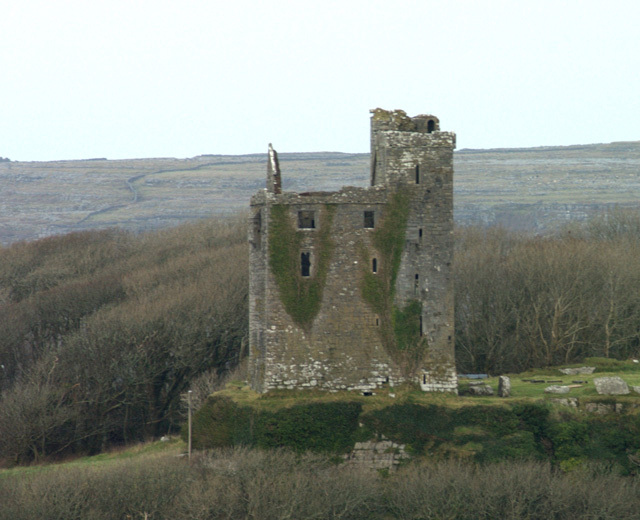 In 1564, the control over West Corcomroe passed to the O`Briens and years later the castle was granted to Turlough O'Brien, a member of the family living in Ennistymon. The Ballinalacken O'Briens trace their descent from Turlough Don who died in 1528, and also from the Ennistymon O'Briens, which was founded by Sir Donald O'Brien of Dough castle who died in 1579. The O'Briens were one of the most powerful families in Ireland at the time and built several castles - of which Ballinalacken is one.